At Bundoora Dental Clinic we care about preventive dentistry. Preventing tooth decay and the need for fillings is our priority, particularly when it comes to children's dental health. Applying fissure sealants to children's teeth beginning from the age of 6 can prevent cavities forming in baby teeth which can then lead to further issues as their adult teeth grow. Fissure sealants are a thin plastic coating that is applied to the grooves of the chewing surfaces of the back teeth to protect them from tooth decay. 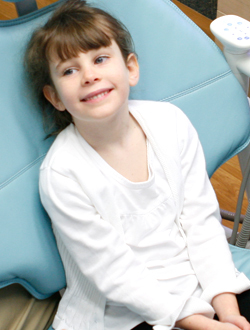 Most tooth decay in children and teenagers occurs on these surfaces. Sealants protect the chewing surfaces from tooth decay by keeping germs and food particles out of these grooves. When children are young and are just learning to brush their teeth, they can quite often miss these areas at the back of their mouth as they are difficult to reach. By preventing food and germs in these areas, it is avoiding the problem of early tooth decay and dental hygiene issues. For further information about fissure sealants, please call 03 9467 3733 to make an appointment.